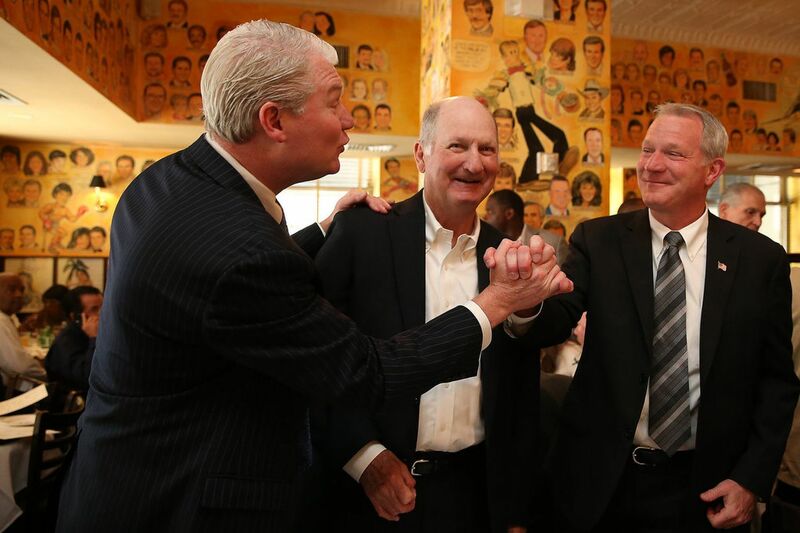 John Dougherty (left) business manager of IBEW Local 98, congratulates his brother, Kevin Dougherty (right) during the 2015 campaign for Pennsylvania Supreme Court, as their father, John Doughterty Sr., looks on. Pennsylvania Supreme Court Justice Kevin M. Dougherty is among the family members federal prosecutors say received home repairs or other benefits allegedly paid for by labor leader John J. Dougherty with stolen union money, according to five sources familiar with the investigation. Though the justice is not identified by name in court papers in the criminal case against his brother, the sources — who were not authorized to publicly discuss the case — said he is the individual described as “Family Member No. 4” in the indictment unsealed last week. Prosecutors allege Family Member No. 4 received contracting work on his home in Northeast Philadelphia and snow removal services one day in 2016 on the union’s dime. Justice Dougherty did not report receiving any benefits from his brother or the union on his annual financial disclosure forms. Prosecutors have not accused him of any wrongdoing. Nor do they say in the indictment that he sought any of the benefits that allegedly came his way or what they were worth. The justice declined to comment Wednesday, as he has done throughout the years-long federal probe into his brother’s leadership of Local 98 of the International Brotherhood of Electrical Workers. But his lawyer, Courtney Saleski, said that he never knowingly accepted any of the benefits outlined in the union boss’ indictment. Kevin Dougherty “is an honest public servant who has done nothing wrong,” she said in a statement. Justice Dougherty is by far the most prominent of the 10 Dougherty family members who prosecutors say benefited from what they describe as John Dougherty’s illegal largesse. Others identified by the Inquirer include the Dougherty brothers’ father, John J. Sr.; sister, Maureen Fiocca; and John Dougherty’s wife, Cecelia. Local 98′s support and financial backing helped propel Kevin Dougherty, 56, onto the state high court in 2015. His victory has been seen as the crowning achievement of the electoral machine that John Dougherty, widely known as “Johnny Doc,” has built over his quarter-century overseeing the union. Since then, the brothers have made it a point to stay out of each other’s public affairs. Justice Dougherty recused himself from the only appeal directly involving his brother to appear before the high court since his election. He also stepped aside in a case over another issue that plays a prominent role in John Dougherty’s indictment — the legal fight over Philadelphia’s soda tax. The union leader was a vocal supporter of the measure, but FBI wiretaps quoted in court papers portrayed the Local 98 leader’s support as part of a petty feud to punish a rival union he believed would be hurt by the tax. Despite that professional distance, the indictment suggests that the brothers remain close. It says, for example, that John Dougherty authorized Local 98 to pay a contractor who did “construction, repair and painting” work at Kevin Dougherty’s home in 2011. Though prosecutors did not specify the cost of those services, they alleged the bill for seven days of work was picked up by Local 98. The union also allegedly paid for the snowplows that showed up at the justice’s house on Jan. 23, 2016. A year earlier, John Dougherty was caught on an FBI wiretap offering his brother a free membership to the Sporting Club at the Bellevue in Philadelphia and boasting of his role as a provider. Saleski disputed the government’s characterizations of each of those transactions Wednesday. She maintained that the justice rejected his brother’s offer to pay for a Sporting Club membership and that he had “no reason to know” who shoveled the snow outside his house on the day referenced in the indictment. “The justice and his neighbors shovel their own snow,” she said. Staff writers Chris Brennan and Dylan Purcell contributed to this article.